JOSAA Documents Verification- Required Documents, Verification Process 2019: Registration for JoSAA 2019 counselling is likely to start from the month of June 2019. Thereafter, candidates will be able to register themselves for JoSAA 2019 counselling, where they will be allotted seats and they have to report the reporting centres for the verification of all the required documents on the date and time assigned to them. JoSSA (i.e. Joint Seat Allocation Authority) is basically an authority which has been set up by Ministry of Human Resources Development (MHRD) of India. JoSAA is an authority which has the responsibility of managing and regulating the joint seat allocation for the admission of (JEE Mains)/ JEE (Advance) qualified candidates in its participating institutes like IITs, NITs etc. It is a single platform provided for joint allocation of seats in various institutes. The counselling for JoSSA 2019 is expected to start in the month of June 2019. 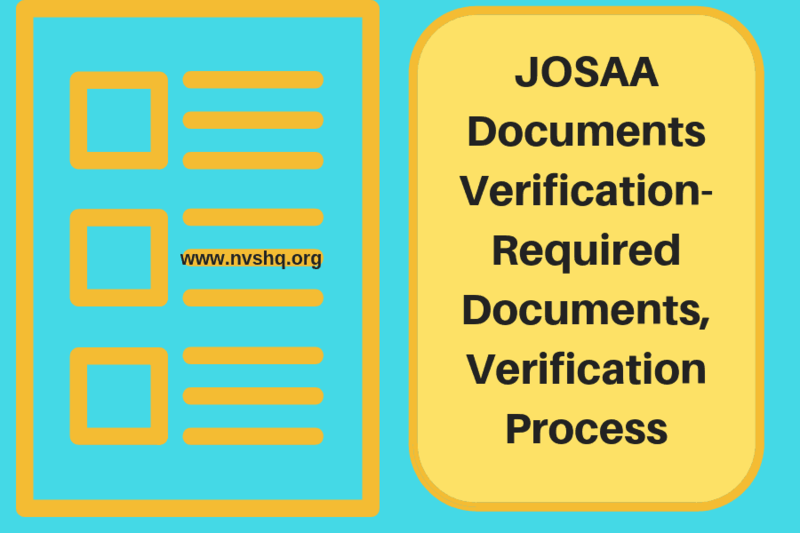 In this article, we have shared all the details related to the document verification, verification procedure, documents required in JoSAA 2019. The first step of JoSAA counselling is to register and fill the choice. Registration for JoSAA 2019 will probably start in June 2019. Candidates must check their eligibility before registration. Candidates have to login with their JEE (Mains)/ JEE (Advanced) roll number and password. Under this step, candidates have to fill their preferred choice and lock it. Candidates will be able to arrange, rearrange and inter-change the choices. Lastly, candidates have to save the final choices. Candidates are advised to take a printout of the final choices. Under this process, candidates will be allotted seats and ranks. Seats will be allotted to the candidates on the basis of the merit of the candidates in his/her preferred participating college. Seats and ranks will be announced only through online mode. Allotment letter will be issued to the candidates and they are required to download the same from the official website. Candidates have to make a payment seat acceptance fee of Rs. 45000/- (For general candidates) and Rs. 20,000/- (for reserved category candidates) through e-challan or SBI net banking. The last step of the counselling process is the reporting of candidates at the designated reporting center. Candidates have to bring all the original documents required for the verification along with a photocopy at the reporting center. If any candidate fails to attend the verification process, his/ her admission will be cancelled. Candidates are advised to attend only the reporting centres which are allotted to them. Below we have shared the list of all the documents required for JoSAA 2019. Candidates are required to bring all the given documents to the reporting centres on the date and time allotted to them. Candidates must bring all the aforementioned documents in original and also a photocopy of the same to the reporting centre. Candidates not complying with this instruction may lose his/ her candidature.